and I am a web developer. I specialize in Squarespace as a CMS. In 2015, The Treasury relaunched the site, marking the addition of in-depth maps, timelines, clan data, religious incarnation lines, and embeddable content. These new features are complemented by an improved design and user interface. We work closely with our partners at Tibetan Buddhist Resource Center, Himalayan Art Resources, and the Rubin Museum of Art to improve data and share information. The team at the Treasury wishes to acknowledge everyone who has collaborated to help create the site, which was originally known as The Tibetan Lineages Project. Chief among them are Matthieu Ricard and Vivian Kurz, who originally created the site with design work by Charles Forcey, and engaged the scholars who wrote the first essays. Asa Hardcastle and Weston Happ architected and coded the new site. 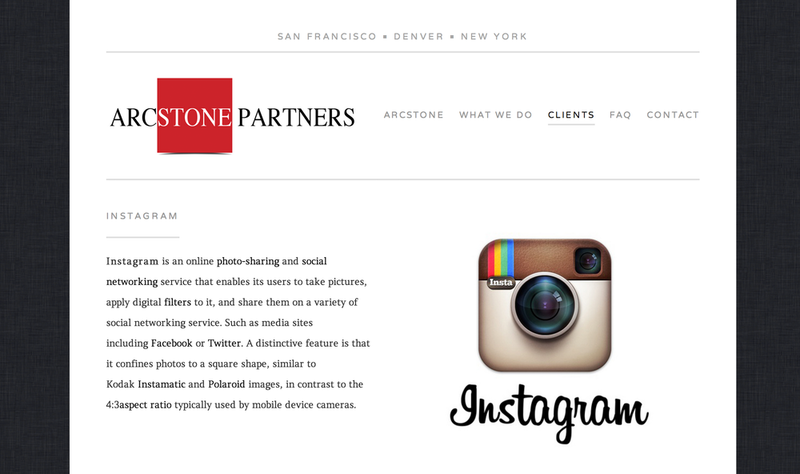 Arcstone has become one of the most highly respected valuation firms in the country. Members of our team have been quoted in the New York Times, the Financial Times, Fortune, the LA Times, and other noteworthy publications. We have over 250 active clients, 100% of which are referenceable, and many of which are household names. Our walls are decorated with handwritten letters from our clients praising our work and thanking us for our great service. In service to our peers in the industry, we are charter members and executive committee members of the Fair Value Forum, a valuation think tank that focuses on the needs unique to Silicon Valley-style tech startups. We have also served as experts in highly complex litigation cases involving the pricing of secondary shares of private company stock, an emerging and evolving area of business valuation in which we are deeply experienced. We have been entertaining guests in the Berkshires since 1977. That is when we opened our first restaurant in Great Barrington. Since that time, we have served hundreds of thousands of guests. We have been successfully reviewed by the New York Times, Boston Globe, Newsday and many other respected papers. We are currently recommended by Zagat, Frommer’s Travel Guide, AAA and most recently included in Bon Appetite’s 50th Anniversary Issue (October 2006). Cedonix is a leader in network services for small and medium-sized businesses, offering a proven service portfolio for customers looking for a wide range of products and services including simple monitoring services to complete outsourced IT solutions. Cedonix’s proactive services enable customers to lower IT service costs, usher in a new sense of business security and, foremost, provide customers peace of mind knowing their IT services are in trusted hands. Based in New York City Cedonix services all types of businesses with cutting edge technology solutions.